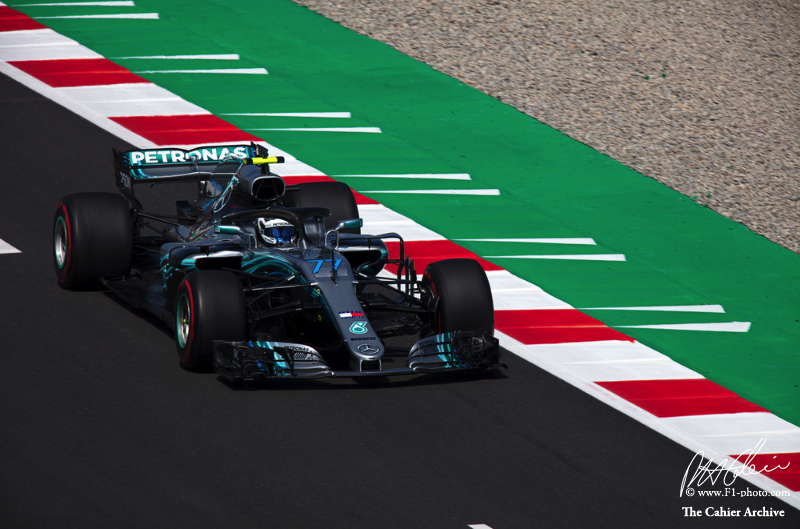 Losing the Azerbaijan Grand Prix in the final laps because of a blown tire was bitter blow to Valtteri Bottas. But the Mercedes driver made a healing step by clocking the fastest lap in Free Practice 1 for the Spanish Grand Prix. The line-up for the weekend was: Mercedes – Lewis Hamilton and Bottas; Ferrari – Sebastian Vettel and Kimi Raikkonen; Red Bull TAG Heuer – Daniel Ricciardo and Max Verstappen; Force India Mercedes – Sergio Perez and Esteban Ocon; Williams Mercedes –Lance Stroll and Sergey Sirotkin; Renault – Nico Hulkenberg and Carlos Sainz; Toro Rosso Honda – Brendon Hartley and Pierre Gasly; Haas Ferrari – Romain Grosjean and Kevin Magnussen; McLaren Renault – Fernando Alonso and Stoffel Vandoorne; Sauber Ferrari – Marcus Ericsson and Charles Leclerc. In FP1, however, Williams reserve driver Robert Kubica replaced Sirotkin. While he has done some testing on other occasions, this was the first time Kubica had participated in a race weekend since 2010. The 2.892–mile (4.655 km) 16–turn Circuit de Barcelona-Catalunya is familiar territory for the teams and drivers. "Heading to Spain really feels like coming home after all the long flights in the first part of the year," Ocon said. "Barcelona is probably the track I know the most – it's the first track I drove in single seaters at the start of my career. We test a lot there so we know the place well and we get our hospitality buildings back so it feels much more like a familiar environment." Pirelli's slick tire compounds for the weekend were the medium, soft and super soft. The ambient temperature at the start of the 90-minute session was 66 degrees Fahrenheit (19 degrees Centigrade) and the track temperature was 88 degrees Fahrenheit (31 degrees Centigrade). There was a zero percent chance of rain. Once they had completed their installation laps the drivers headed back to the pits to talk with their engineers. The Mercedes duo, Stroll and Verstappen didn't even bother to do an install lap in the early going. Ocon clocked the first flying lap of the session – a 1:22.592. But Raikkonen quickly trimmed that down to a 1:20.262. Vettel had a quick spin in the other Ferrari at Turn 13, and Bottas looped it at Turn 10. Ericsson then split that by spinning at Turn 12. Meanwhile, Hamilton was on the move and jumped to the top of the times with a 1:18.997 just before the half-hour mark. But he didn't stay on top for long as Bottas turned a 1:18.703. Both were on the soft compound tires. More drivers were having offs. Hartley took to the gravel at Turn 4, and then Grosjean did the same. Ricciardo set the third fastest time, but several laps later went off and hit the barriers, albeit not that hard, at Turn 4. That triggered the VSC. "I just touched the barrier," he radioed. A gust of wind had upset the Red Bull enough to send Ricciardo off. At the 40-minute mark the top 10 were: Bottas, Hamilton, Ricciardo, Vettel, Alonso, Verstappen, Raikkonen, Gasly, Vandoorne and Magnussen. Ricciardo's car was brought back to the garage with 35 minutes remaining in the session. He was missing valuable track time. Things got going again on track after the break. "Tires are like in winter testing - no grip," Hulkenberg radioed about the super softs. Then Kubica had a spin at Turn 13 on the super softs but kept going. Stroll, also on the super softs, slid off at Turn 5 but was unable to get back on track. His car was lifted away by the tractor crane. With just over 20 minutes remaining in FP1 the top 10 were: Bottas, now with a 1:18.148, Hamilton, Ricciardo, Vettel, Grosjean, Alonso, Verstappen, Vandoorne, Raikkonen and Gasly. Vettel then used the super softs to move into third place albeit 0.950 of a second slower than Bottas. Raikkonen was now third but even more off the pace of the Mercedes. And the healing Bottas remained well clear of the rest as the session wound down. Hamilton, Vettel, Verstappen, Raikkonen, Alonso, Ricciardo, Grosjean, Vandoorne and Gasly rounded out the top 10. Kubica was 19th and Stroll 20th.